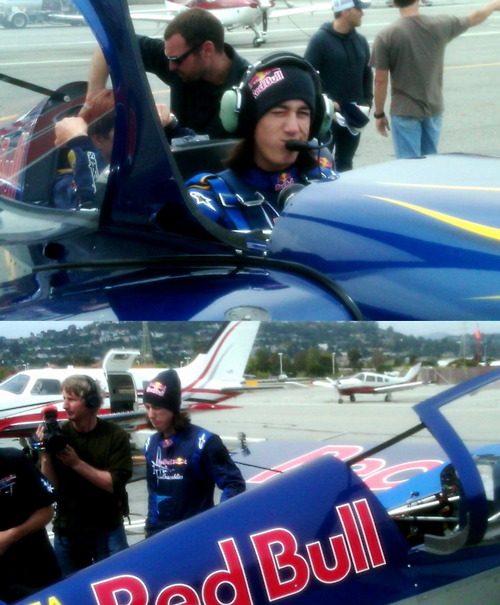 Friday afternoon San Francisco Giants starter Tim Lincecum took one of the Red Bull planes out for spin from tiny Santa Rosa Airport in California. Twenty years from now, can you imagine if we’re calling him Pilot Lincecum? See more pictures from Tim’s Facebook page. Of course, Giants fans are a little P.O.’d today after “The Freak” walked a career-high six batters in a 5-2 loss to the Atlanta Braves. In his last start on Tuesday, he took a no-hit bid into the eighth inning against the Colorado Rockies, so we should cut him some slack. This entry was posted in Advertising, Promotions, San Francisco Giants and tagged Advertising, Airplanes, Atlanta Braves, Baseball, Colorado Rockies, Major League Baseball, MLB, Promotions, Red Bull, San Francisco Giants, Santa Rosa, Tim Lincecum. Bookmark the permalink.